Fania Davis thinks the time has come for a truth-telling process about racial injustice in the United States. A noted activist and the founding director of Restorative Justice for Oakland Youth (RJOY), Davis has confronted systematic racism for decades, working from Birmingham, Alabama to the Bay Area and beyond. But she noticed renewed grassroots momentum to explore the legacy of slavery in the aftermath a white police officer killing Michael Brown, a black teenager, in Ferguson, Missouri three years ago. Brown’s death catalyzed local conversations not just in Missouri, but across the country. Now, Davis wants to build on those discussions and facilitate a national truth-telling process that places community-level dialogue at its heart. To lay the groundwork for a cohesive national process, Davis and her team at RJOY are mapping truth-telling initiatives across the US and building a network of activists. ICTJ’s Sam McCann sat down with Davis and her colleague at RJOY, Jodie Geddes, to discuss their vision for a national process, what they hope it would achieve, and what they have learned from their conversations with local leaders so far. How would a grassroots truth commission in the United States fit into the current dialogue about racial justice? Can it shed a light on the historical legacy of racial violence? Fania Davis: Well I think that the narrative of the US as a post-racial society has been challenged by the Black Lives Matter movement particularly. And of course that began largely with Ferguson. As a direct result of those young activists’ persistence, their staying out there until the whole world listened, today whenever a police killing happens, we are going to know about it around the world. There’s going to be international publicity today. And the consciousness around mass incarceration has also complexified that narrative of racial progress. With the movement against mass incarceration that started before the turn of the century and advanced with Michelle Alexander’s book and after that with the movie, 13th, a popular critical consciousness about mass incarceration has emerged in this country. These movements have started to fill in the gaps around truth-telling, but we still need a Truth and Reconciliation Commission. We do not need it to function the exact same way as truth commissions in places like South Africa, where victims had never previously been able to tell their stories publicly. In the United States, these stories are increasingly becoming known. What we do need, though, is a commission to deepen and shine a light on all the truth telling and racial healing work that is going on. We need a Truth and Reconciliation process to bring together all of these disparate initiatives to coalesce in a more coordinated process that will result not only in truth-telling, but also in racial healing and transformative reparation. Jodie Geddes: A huge part of the work that we’re doing right now is a mapping initiative of groups addressing historical harms, particularly those against African-Americans. And so right now, we’re documenting where these initiatives are happening and what we really found so far is that we’re not just talking about organizations, but we are also talking about individuals that are lifting up the truth, whether it is in their classrooms or whether it is in their local community as organizers. What are you learning from this mapping work? Jodie: From documentation, we are seeing that people are heavily engaged in memorialization. And a lot of people are talking about Equal Justice Initiative’s historical marker and lynching memorialization efforts, but there are other people who are going back to the sites of historic harms on a local level and bringing the descendants of those who were enslaved to the same table as descendants of slave-owners. We are finding all of these initiatives happening on a community level, so our question now is: how do we connect these groups, pool resources, and build capacity? We are looking to create an electronic data map that helps document some of the truths these local groups are exposing and helps connect them with each other. These maps are a way for people to build deeper relationships with each other. It also allows us to begin to think about oral histories in a different way. We often rely on newspapers, textbooks, other “gatekeepers of knowledge.” But who are the people in communities that are the gatekeepers of knowledge and have the stories, and how do we allow for those stories to be shared? Fania: Every day I learn about some new truth-telling or racial healing initiative. Not nearly enough people in the U.S. know about this amazing and hopeful work. The first thing we want to do as Jodie explained is to lift up and begin to make this work visible nationally through the mapping and networking process. Our project is intended to network these disparate initiatives, now kind of siloed, that are bubbling up all over the country so that they might become aware of themselves as part of a broader national movement; for example, the Black Women’s Truth and Reconciliation Commission, Bridging the Divide (between Chicago police and communities they serve), Universities Studying Slavery, the work at Georgetown, Harvard and Brown Universities, Ferguson’s Truth-Telling Project, Northeastern University Law School’s Civil Rights and Restorative Justice Institute, Coming to the Table, Equal Justice Initiative, Richmond’s Initiatives of Change, the Kellogg Foundation’s Truth, Racial Healing, Transformation Enterprise, The Mass Slavery Apology, the emergence of slavery and lynching museums and so many others. After you map these groups, what comes next? Fania: After the electronic mapping and networking phase, a series of national convenings would be next. Their purpose would be to engage in relationship-building and chart a course for building a nationwide Truth and Reconciliation movement. Participants might include family and community members impacted by police violence, responsible parties or their representatives, organizers of local initiatives, faith-based groups, etc. As part of the effort to lift up the truth-telling, racial healing and reparations work underway in the nation, RJOY is thinking of doing a road trip to maybe 12 different areas in the nation to further document their work. And after that road trip we would like to create a short film, as well as a book that is not too heavily academic, so that people can learn about what is going on and hopefully be inspired to get involved. And at some point of course we want to start talking about what is the national entity that is going to pull all of these things together. And it is really more of a truth, racial healing and reparations movement that we are talking about building, and the hub of that movement would be, would function sort of as a national commission. How would a national commission work? Fania: Central to the truth and reconciliation design would be safe public spaces in local hubs across the nation for youth, families, neighbors, witnesses, and other survivors to share their stories. These spaces would also serve as sites for dialogical encounters where we engage in public truth-telling and where parties take responsibility for wrongdoing. Skilled restorative justice facilitators would facilitate the encounters. Community ownership of the process of transforming mass harm as envisioned in our truth and reconciliation model has precedent in West Africa. In Sierra Leone, the ancient process of Fambul Tok (or “family talk”) has been revived to address issues arising from a brutal civil war. This process brings together multiple voices—religious and political leaders, influential community members, youth, war victims, former combatants—for “family talk”, a deeply communal process arising in community spaces often through facilitated encounters between parties causing and experiencing harm. That said, a national center and national commission of high-level experts who hold hearings, examine evidence, and prepare findings and recommendations would also be important design elements of the overall process. The Commission might also have an important role as a sacred public site for truth-telling, confession, and apology on a national stage. A national commission might serve various functions, including assembling and disseminating what is discovered on local levels and providing technical assistance to them. National and local processes would support one another synergistically. The National Center could also help establish training and practice standards for facilitators of encounter processes. Its function as convener and resource center for local and regional initiatives across the nation would be just as important as the more traditional roles of taking testimony, archiving, and engaging in fact-finding and report-writing. But a centralized, top-down approach alone will not achieve sustainable outcomes. To move toward a reconciled America, we cannot simply rely on experts; we have to do the work ourselves at community levels. We as citizens must roll up our sleeves and do the messy, challenging work of collectively creating transformed relationships and structures leading us into just futures. We as citizens must roll up our sleeves and do the messy, challenging work of collectively creating transformed relationships and structures leading us into just futures. What would its relationship be with the government? Fania: Government partnership is desirable, but it needs to be carefully monitored to mitigate the risk of appropriation. Only governmental entities can mandate the revision of public school textbooks to tell the truth about our history, enable the renaming of streets, authorize the public installation of commemorative plaques, require that police be trained in community and restorative justice, and create public museums and memorials. A final point about design: How do we as a nation heal from pervasive historical harms? Because the past is not past, and because the history of racial terror in our country is still driving persistent racial violence, we need to intentionally engage a process that allows us to face and begin to heal the massive historical harms that daily take the lives of black and brown people. In the course of your work have you drawn on any comparative examples around the world? Jodie: I think about Rwanda. The Gacaca courts in Rwanda are an example of local and native processes that could have relevance when institutions like national or international court systems are not sufficient to grapple with the underlying issues – for one thing, in Rwanda, it would have taken hundreds of years to try all those cases through the ICC. Like Fania, I have been looking at Sierra Leone and Fambul Tok too. That is a process that does not need to be monitored, that does not need to be policed. The power already exists within communities. Fania: We can also learn from what was done – and from what was not done— in the South African Truth and Reconciliation Commission, especially on the issue of reparations and economic restructuring. I doubt that that South Africa’s Truth and Reconciliation Commission or any truth and reconciliation commission for that matter has the capacity to transform the economy. But much more could have been done in the way of reparations. How do you view reparations as a component of your work? Fania: First, I would want the United States to focus more on reparations, and not in the sense that is commonly understood as a check for victims, as in Germany and with the Japanese -although in Germany the checks were just one aspect of a more multi-faceted approach. But how do we talk about reparations in ways that are transformational? Because you can hand a check to someone who has been a victim of genocide or of slavery but it is not going to stop the ravages of global privatization. It may be a small palliative but it is not going to stop the suffering that is happening economically. 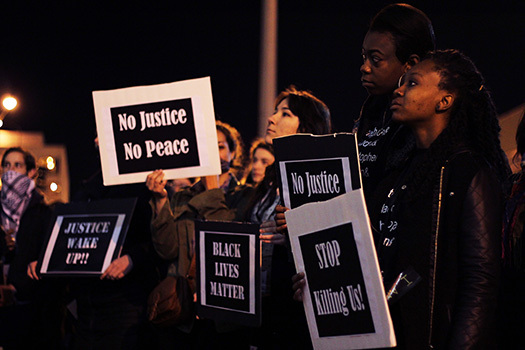 It is not going to stop police terror or mass incarceration. How do we create a multi-dimensional, complex reparations process that includes transformative economic measures? So I think a lot more attention needs to be given to that in the Truth and Reconciliation process in this country. We saw negatively what happened in South Africa when there was not really sufficient focus on it. Jodie: There is an expansion of the understanding of what reparations can look like and what reparations can be. As part of this mapping project I have seen a transformation of reparations moving from something that is just focused on a “hand-out” or cash from the government to the means by which communities build sustainable ways of living. So when we think about economic dignity for example: what does it mean for everyone to have access to housing, access to food? You view reconciliation as an explicit aim of your work confronting the past in the United States. That is not always the case in transitional justice processes. Can you talk about why you see it as such a critical component here? Fania: I do not think there have been a lot of truth and reconciliation processes that have named restorative justice as their foundational ethos other than in South Africa. But even the South African process itself tended to be top-down, expert-driven. What Jodie and I are envisioning is a truth process that has restorative justice and the associated participatory, local, community-based, bottom-up values at its center. We are adopting Nelson Mandela’s understanding of reconciliation. It involves working together to correct injustice. It means furthering interpersonal healing on a societal level to move a racially-fractured nation into a transformed future and into an era of equity and harmonious coexistence. When we talk about a restorative justice based process, we are talking about a process that aims to both bring about justice and healing. And the ‘healing’ part is so important for us in this nation. We have historically sought justice with varying degrees of success. We have had important pro-democratic struggles in this country that succeeded in abolishing slavery, yet the racial terror and racial violence that was the essence of slavery survived and continued on with the convict leasing system, Jim Crow and lynching. Though we had movements and passed laws to abolish convict leasing, lynching, and Jim Crow, today they remain, having morphed into racialized mass incarceration and police terror. I think we have reached an historical point in this country where it is clear that if we do not seek both justice and healing, injustice will keep replicating itself ad nauseum. My sense is that because slavery is one of the two original traumas in which this nation was born—the other being genocide of Native Americans— if we do not engage in some intentional and deliberate and focused effort to heal from those original traumas drawing on the latest advances in the fields of restorative justice, neuroscience and trauma healing, they will keep replicating themselves. Even though we made changes to our social structures and institutions, this trauma, the racial terror that has existed since the very beginning, will persist unless we engage in some sort of very carefully thought through and very intentional healing process as a nation. And the way that I envision this is through a process of primarily restorative justice encounters happening in communities throughout this nation networked and connected through a nationwide hub. I think we have reached an historical point in this country where it is clear that if we do not seek both justice and healing, injustice will keep replicating itself ad nauseum. Jodie: I think in many ways it is about reconsidering reconciliation as not trying to go back to something but about building deeper relationships. Relationships in which we see people as human beings with dignity and not bound by the systemic labels that have been given to them. For me, a lot of this work around reconciliation is really thinking about the human dignity of all, and how do we create systems that allow for us to be in deep community with each other. When you reflect on your conversations with local leaders all over the country, what experiences stand out to you as illustrative of the work you would like to pursue through the truth commission initiative? Jodie: One of the stories that stands out to me is Doria Dee Johnson who is an historian, and her great-great-grandfather Anthony Crawford in 1916 in South Carolina was lynched. The family was pushed out of Abbeville, South Carolina after that. But now, 100 years later, they have a historical marker in Abbeville. And they ended up working with EJI to go back to the site and collect the soil – and the soil in turn will be placed in EJI’s national lynching museum alongside soil from hundreds of other lynching sites in the South. What does it do the tenor of a town like Abbevile when instead of memorials to the Confederacy, there are memorials that reflect the history of racial injustice? Jodie: Doria has said the installation of the marker signaled a “seismic shift in Abbeville. There is now a black mayor, and the local Crawford family reports that black and white people say, often in hushed tones, "It is about time that history is exposed. We are all free now to talk." You are taking on this work in a unique political climate. How do you engage the white community in this work, particularly in the age of Trump? Fania: Since the election of Trump, as I travel around the country I have observed intensified commitment and action on the part of anti-racist white activists. Showing Up For Racial Justice is an example. This is an organization of white people that has grown to 200 chapters across the country. Their mission is to engage white people in the movement for racial justice through political education, public events, and protest action. This level of organized anti-racism activism by white people is new historically in this country! Something else that is new is white people are increasingly realizing they have skin in the game. The white savior approach to activism is becoming extinct. There is the growing recognition that, even as whites undeniably possess white skin privilege, the system of white supremacy over the generations has historically exacted and continues to exact a moral, spiritual, and psychological toll. Also, we see restorative justice practitioners taking the bull by the horn. At the recent national restorative justice conference in Oakland, there were more than four oversubscribed workshops and panels on critically examining whiteness. And they did this not just on cerebral levels, but in interactive and participatory ways that allowed participants to move beyond white fragility and other defensive emotional reactions that usually cause more harm when occurring in mixed spaces. This prepares white people to engage in a productive encounter using the circle process with people of color to address racial conflict and ultimately to transform historical harm in the ways we would like to see with a truth and reconciliation process.